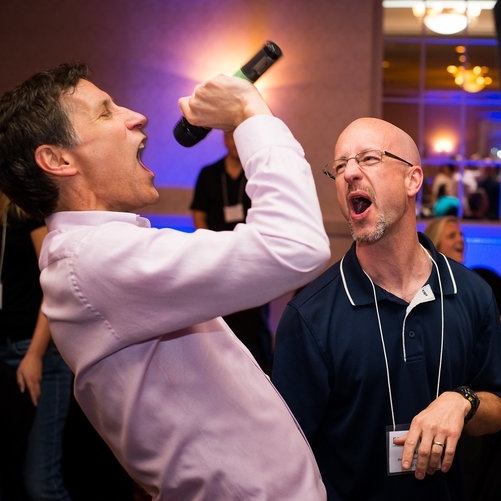 An awesomely fun, on-trend group activity that gets participants up on their feet, singing, dancing, and battling head to head in the ultimate music competition. Your classic game show host and his glamorous assistant (who is also a professional singer) will divide the room in half and pit teams against each other in a series of music-based games. Representatives from each team are called up to show off their best moves to Taylor Swift’s dance hit “Shake it Off”. Top contenders on each side must face off before a neutral judging party and show off their best “Running Man” “Sprinkler” or even “Fax Machine” - whatever they can rock with the most confidence! An iconic pop/rock song is played, but right before the chorus, the music is cut and guests must guess the next set of lyrics. Guests choose a category from one of your hosts’ glitzy gold jacket pockets and must identify the song, the artist, and sometimes the cover artist or the mash-up to earn points. Your glamorous assistant even sings some snippets acapella! I wanted to send you a note to say THANK YOU very much for all that you did to make our sales rally such a success! Kicking it off with Name that Tune was perfect, and everyone loved it! The team building event [Playschool Playscapes] was incredible, I have had so much great feedback about how fun it was, and how much they loved the fact that we were “giving back”. I know that was a lot of work for your team to prepare, and we truly do appreciate you working with us to make that happen!